For those just joining us – feel free to read Part 1 and Part 2. As mentioned previously, the timeline of changes isn’t all that clean. France’s Joel Bats wore the horizontal pinstripes of Part 2 as they won Euro 84, but that tournament saw adidas’s newest goalkeeper look unveiled, and it would last for the guts of four years. A common theme through these articles so far has been West Germany goalkeeper Harald ‘Toni’ Schumacher and he was again to the fore with this new look. As usual available in a number of colours, it featured diagonal stripes on the torso, tonal to the main colour. 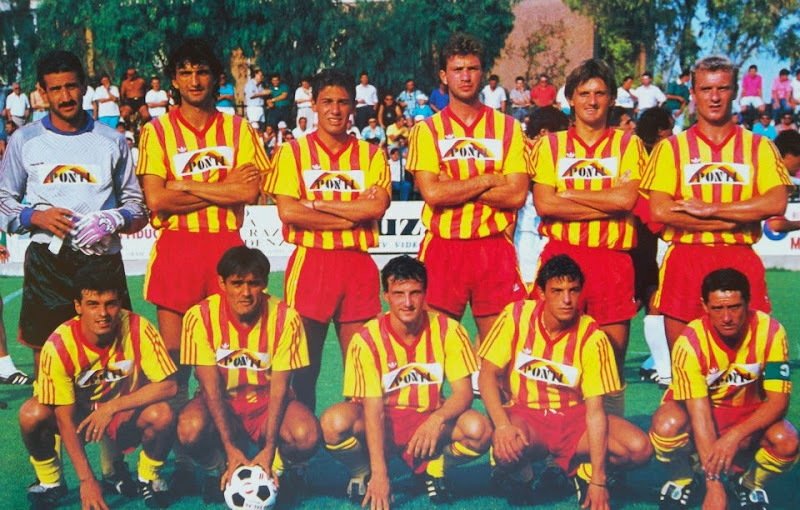 Whereas dark shorts were generally the order of the day with past designs, now there was an option to match the shirts. In the spring of ’84, Germany played France in a friendly and Schumacher appeared in yellow shirt and shorts, with white socks. He would don the blue look more at the European Championships, though, while a red variation was available but not used. Also utilising the new look at the Euros were Belgium, Romania and Yugoslavia. 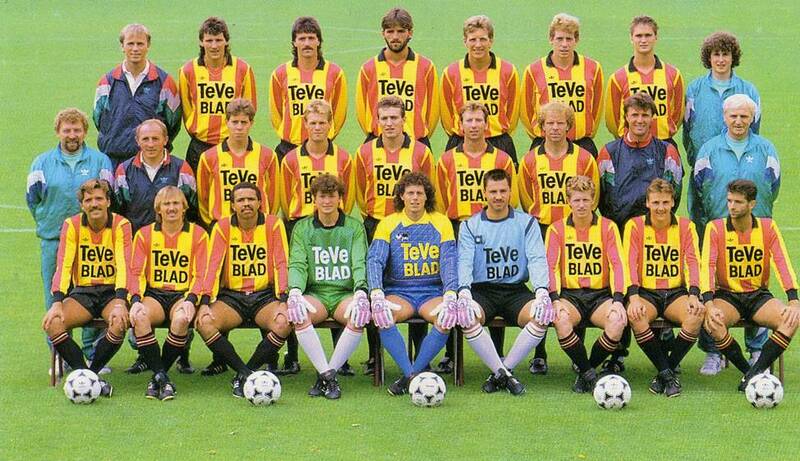 For some reason, Belgium goalkeeper Jean-Marie Pfaff had black stripes on his shorts and socks. Pfaff would later be seen – for his country and his club, Bayern Munich – with extra padding, creating a ‘quilted’ effect. As we have no evidence of anybody else with this variation, we must assume that it was an after-market addition that he arranged himself. Whereas the previous two styles covered weren’t seen in England, the diagonal type was, with Manchester United’s netminders, Garry Bailey and Chris Turner, using it in 1985-86. In the same season, Steaua Bucharest reached the European Cup final, beating Barcelona on penalties. Their keeper Helmuth Duckadam was the hero and he too wore green. By the 1986 World Cup, it had become fairly ubiquitous, though also on the verge of being superseded. The most interesting variation was that worn by Canada goalkeeper Paul Dolan. Two unusual variations were used by Argentinian goalkeeper Nery Pumpido with his club, River Plate. The green version was of a different shade to the Manchester United/Steaua Bucharest shirts, and later in the 80s he wore purple – we haven’t found anybody else wearing it, and the sleeves were cut slightly differently. 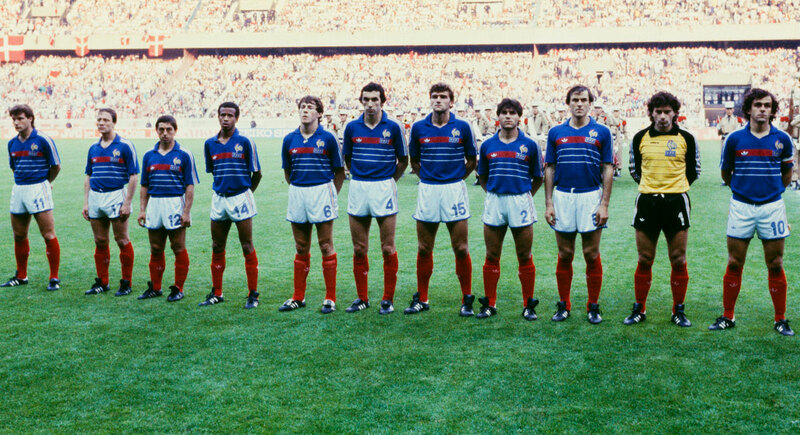 As mentioned above, France didn’t use the design, but the distinctive white-blue-white-red-white striping tape used by them was also seen on Yugoslavia shirts – in fact, the Yugoslavia shirt of 1987 was pretty much exactly the same as that used by France in 1982. The accompanying GK shirt was in this style and used the striping. The last documented usage we have is from October 1988. While Hans van Breukelen had helped the Netherlands to Euro 88 victory wearing the new design which succeeded this – featuring a geometric pattern, which we’ll see in Part 4 – for a World Cup qualifier with West Germany he was back in the diagonals, in a rarely-seen grey. As always, a huge debt of gratitude is owed to the users on the forum at The Glove Bag, who provided a wealth of information, including little-known variations of the blue shirt with black stripes and an orange edition mainly sold in the US. Arsenal also had a sky blue version of the diagonal tonal shirt, worn against Plymouth. Nope, he wore both. The one I’m thinking of was in 87. I’ve seen a pic of it also being worn by the arsenal ladies team as late as 1991. Disregard, I thought you’d posted a clip of the 89/90 game (when he wore the one with piping on the sleeve join). You’re right, it was probably the geometric one. Although arsenal did switch between that and the tonal one. Not sure when and for what games though. 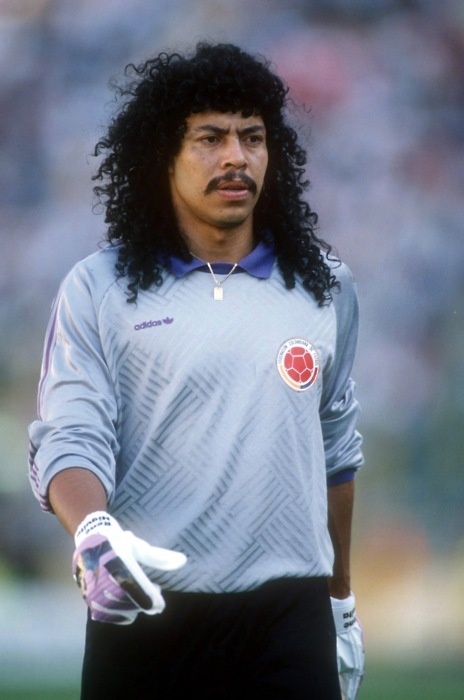 i also remember that between 1988 and 1990 there was a model of adidas goalkeeper jersey that had the sleeves of a different shade and with a diamond padding on the chest (i remember that was worn by Pat Bonner and Joel Bats in 1988 (Yellow with light gold sleeves) and by Higuita in the World Cup 1990 match against UAE (lavender with pale violet sleeves). Also, on a tangent – anyone noticed Plymouth Argyle’s goalkeeper wearing a shirt that was predominantly black on the reverse? I’m sure this wouldn’t have been allowed in a League game given the Football League’s pedantry when it came to navy/black kits clashing with referees. 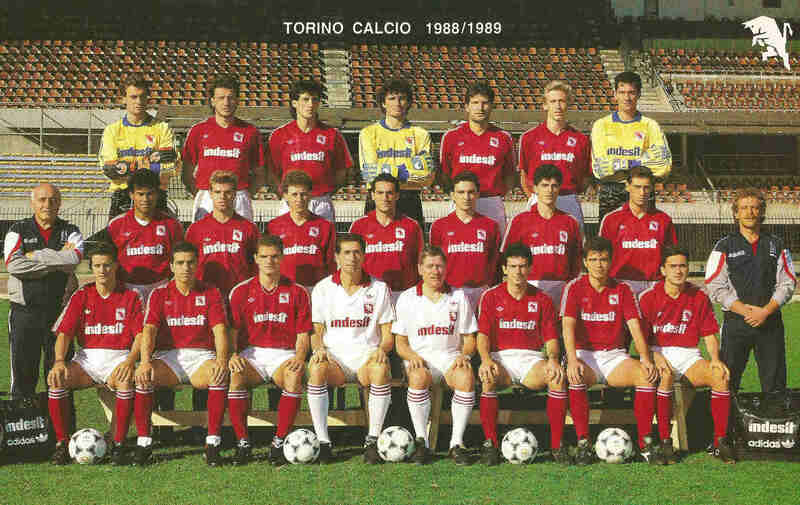 They were already fussy with regards to regulations on goalkeeper’s jerseys up until the 85/86 season. Pffaf’s wife famously sewed the extra protection into de the inside of her husbands goalkeeping shirts! That’s great, didn’t know that! Fair play to her!